I have some really exciting news for you all....a new book is here!! This project has been a total labor of love. I have seen some lovely books that give the Scriptural stories of Holy Week, but no books that walk children through what to expect at the liturgies. This book does both! Our family tries to go to the Triduum liturgies, and if yours does, too, this would be a great little companion to help your 3-9 year old(ish) follow along. However, I know that a lot of families aren't able to make it to those liturgies, but may want to. 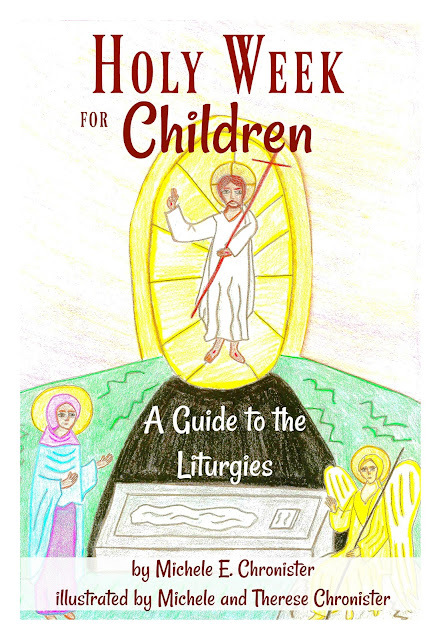 If you aren't able to make it to the Triduum liturgies, this book would be a good way to teach your children about what happens at the most important Masses and liturgies of the liturgical year (without dragging little ones to church past bedtime). You can purchase it on Amazon...just in time for Laetare Sunday! This would be perfect for your Easter baskets.